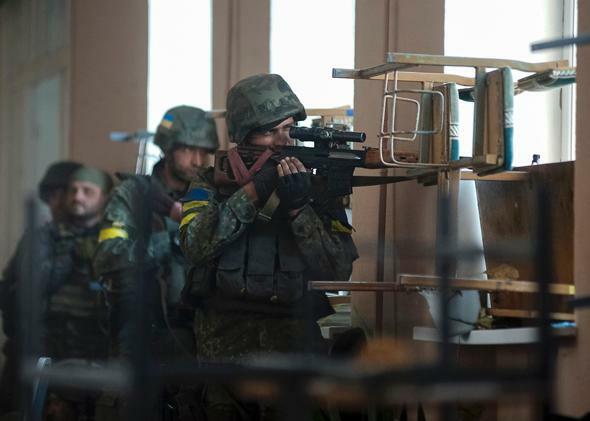 Vladimir Putin’s troops have invaded Ukraine: Should we prepare for war with Russia? Putin has invaded Ukraine. Is it hysterical to prepare for total war with Russia? Or is it naive not to? I realize that this question sounds hysterical, and foolishly apocalyptic, to American or Western European readers. But hear me out, if only because this is a conversation many people in the eastern half of Europe are having right now. In the past few days, Russian troops bearing the flag of a previously unknown country, Novorossiya, have marched across the border of southeastern Ukraine. The Russian Academy of Sciences recently announced it will publish a history of Novorossiya this autumn, presumably tracing its origins back to Catherine the Great. Various maps of Novorossiya are said to be circulating in Moscow. Some include Kharkov and Dnipropetrovsk, cities that are still hundreds of miles away from the fighting. Some place Novorossiya along the coast, so that it connects Russia to Crimea and eventually to Transnistria, the Russian-occupied province of Moldova. Even if it starts out as an unrecognized rump state—Abkhazia and South Ossetia, “states” that Russia carved out of Georgia, are the models here—Novorossiya can grow larger over time. A far more serious person, the dissident Russian analyst Andrei Piontkovsky, has recently published an article arguing, along lines that echo Zhirinovsky’s threats, that Putin really is weighing the possibility of limited nuclear strikes—perhaps against one of the Baltic capitals, perhaps a Polish city—to prove that NATO is a hollow, meaningless entity that won’t dare strike back for fear of a greater catastrophe. Indeed, in military exercises in 2009 and 2013, the Russian army openly “practiced” a nuclear attack on Warsaw. Is all of this nothing more than the raving of lunatics? Maybe. And maybe Putin is too weak to do any of this, and maybe it’s just scare tactics, and maybe his oligarchs will stop him. But Mein Kampf also seemed hysterical to Western and German audiences in 1933. Stalin’s orders to “liquidate” whole classes and social groups within the Soviet Union would have seemed equally insane to us at the time, if we had been able to hear them. But Stalin kept to his word and carried out the threats, not because he was crazy but because he followed his own logic to its ultimate conclusions with such intense dedication—and because nobody stopped him. Right now, nobody is able to stop Putin, either. So is it hysterical to prepare for total war? Or is it naive not to do so?